It’s approximately seven metres tall and nine metres wide with a startling display of pink flowers when it’s in full bloom. 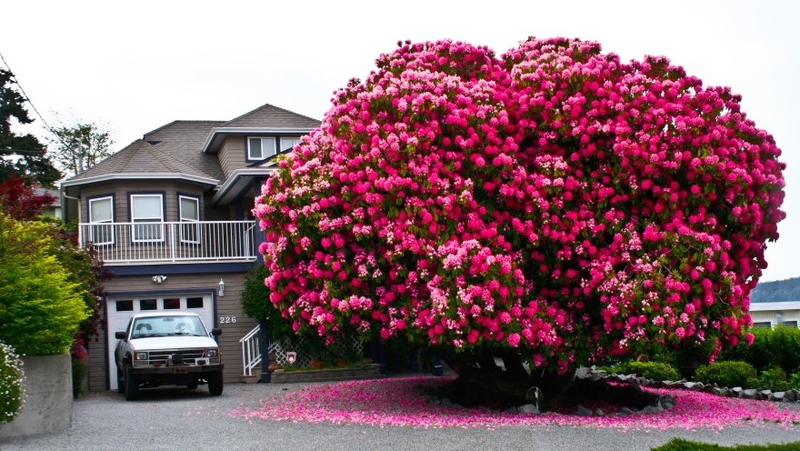 Although it’s often mistaken for a tree because of its size, B.C.’s beloved rhododendron is actually a bush - and a rather spectacular one at that. The more-than-a-century-old shrub, known colloquially as the “Lady Cynthia,” has been attracting international acclaim and visitors from far and wide after it was listed as one of the most beautiful trees in the world by a number of online publications last year, regardless of the fact that it’s not technically a tree. 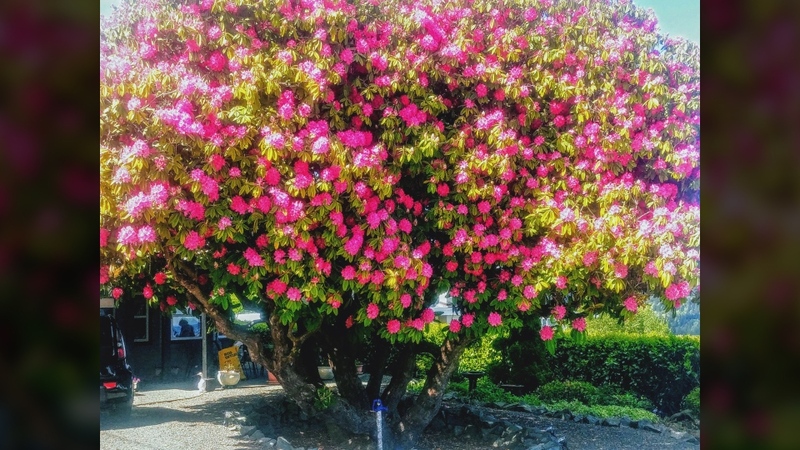 Now that it’s in full bloom again, the Town of Ladysmith, B.C., located on the east coast of Vancouver Island, is preparing for another influx of tourists this year. The large shrub is of the Cynthia variety of rhododendron species and has been overlooking the town since 1889, according to local historian Rob Johnson, who came up with the name Lady Cynthia for the popular plant. It’s location atop an east-facing hill in the town is important because it might provide an explanation as to why this particular rhododendron has grown so much larger than its counterparts. Johnson explained that an average rhododendron Cynthia matures to between two to four metres in height and width, which means Ladysmith’s botanical marvel is more than double the normal size. 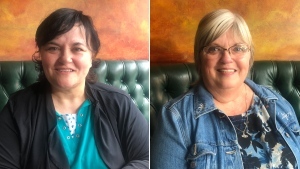 Johnson, a former city councillor and past president of the Ladysmith Chamber of Commerce, said that it’s likely the shrub’s position on the hill has allowed it to flourish. For most of the year, Lady Cynthia just looks like a large, green shrub. But, for approximately two weeks in early May, Johnson said the rhododendron becomes a remarkable sight when it reaches full bloom. In order to capitalize on the increased attention, Johnson said the town’s Chamber of Commerce plans to distribute a press release on the bush this year to attract more visitors to the small town. Even though the beautiful plant is being promoted as a tourist attraction, Johnson also asked sightseers to respect the privacy of the owner of the residential property where Lady Cynthia resides by keeping off the lawn and admiring it from the road. Johnson said the homeowner also expressed concern about the future of the large shrub’s health as the seasons become warmer as a result of climate change. “It’s getting hotter and it doesn’t like more sun and it doesn’t like more heat. It’s weakening,” he said. In an effort to protect the plant, Johnson said the town’s heritage advisory commission is looking into giving it a historical designation at its next meeting. 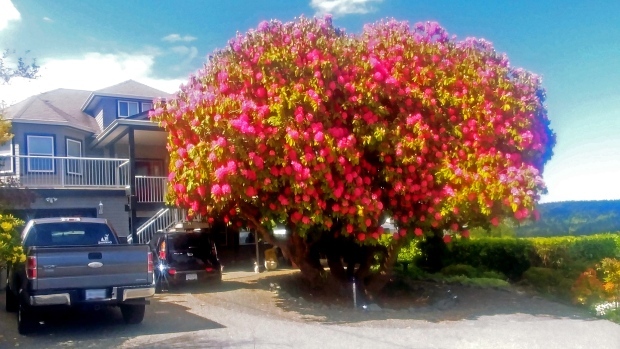 In the meantime, tourists can enjoy the flowering Lady Cynthia by visiting 226 Kitchener St. in Ladysmith, B.C.